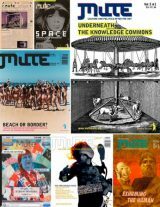 Mute magazine was founded in 1994 by Simon Worthington and Pauline van Mourik Broekman, relaunching a title with an earlier life as a student magazine at the Slade School of Art, London, from 1989-1991. Initially, Mute sought to discuss the interrelationship of art and new technologies, but as mass participation in computer-mediated communications became more integral to contemporary capitalism, its coverage expanded to engage with the broader implications of this shift. Mute publishes articles online on a weekly basis, collating a selection of these into a quarterly printed magazine. Its content combines so-called “clusters” dedicated to specific topics (climate change and capital, the politics of multiculturalism, precarious labour) with a wide range of reviews and commentaries, both of which feature in the print publication. Mute‘s website also features ongoing coverage of relevant news and events contributed by editors and readers in various open publishing sections. In one of these, the “Public Library” torrent, readers can also freely up- and download media files relevant to Mute‘s areas of enquiry (films, recordings of talks, etc.). Mute‘s open submission areas were included in 2005, when its publishing model was oriented fully towards the Internet. This involved making all content freely available online and granting readers a variety of new capabilities, including the creation of their own “Mute”, a file formatted in basic PDF style that brings together selected site content. As Mute itself is also printed on a Print On Demand (POD) basis, it is hoped this latter facility will be extended to allow readers’ personalized versions to automatically go to print too. Mute‘s POD tool is one of several ancillary web-resource initiatives it runs through its sister project OpenMute. After running on a mixed economy of barter, grant and private monies since its inception in 1994, Mute started receiving revenue funding from the Arts Council of England in 1999, which ends on 31st March 2012. "A larger programme of creative destruction"
Climate change CO2onialism: What impacts for the South?